Edinburgh had several workhouses (or poorhouses, as they were more usually known in Scotland). 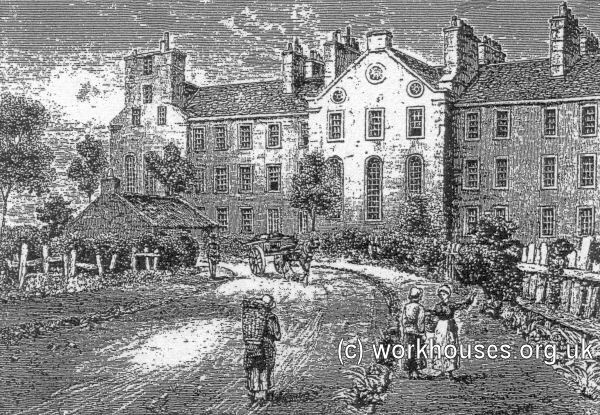 Possibly the earliest poorhouse in the city was St. Mary's Hospital in Leith Wynd, established for the care of twelve almsmen and which was converted into a workhouse by the Edinburgh magistrates in 1619. The Edinburgh Charity Poorhouse in Port Bristo was built in 1739-1743 by Samuel Neilson, mason, and William McVey and James Heriot, wrights. It was financed by voluntary subscriptions. Funds for its operation were raised by a variety of means such as a tax on the valued rents of the city, collections at church doors, charitable donations and other contributions including an annual benefit play at one of the city's theatres. It was a substantial establishment that, in 1777-8, could accommodate 484 adults and 180 children. By 1850, the poorhouse buildings were spread across both side of Forest Road as shown on the 1850 map below. The larger portion, the West Division, comprised the poorhouse offices and board-room the main wing (its northern portion known as the east wing), the separate west wing for women and children, and the washhouse (laundry). A porter's box stood at the main entrance. The East Division included a men's ward, doctor's surgery, chuldren's school and playground. Part of the much altered "east wing" of the poorhouse can still be seen at Forest Hill. 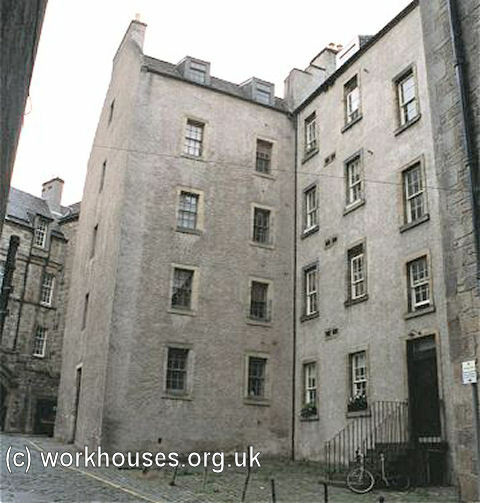 Edinburgh Charity Poorhouse site former east wing from the east, 2001. Edinburgh Charity Poorhouse site former east wing from the north-west, 2001. 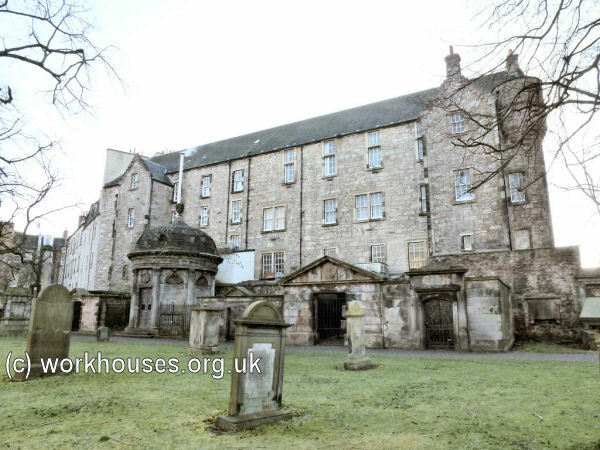 Established by subscription in 1761, the Canongate Charity Poorhouse stood at the north-east corner of Tollbooth Wynd. It was financed by church-door collections and voluntary contributions, and managed by annually chosen members of various public societies such as the incorporated trades. After the passing of the Scottish Poor Law Act of 1845, a parochial board was formed to take over the running of the poorhouse although its membership was largely the same as under the old system. In 1873, Canongate merged with St Cuthbert's parish to form St Cuthbert's Combination, later known as Craigleith. 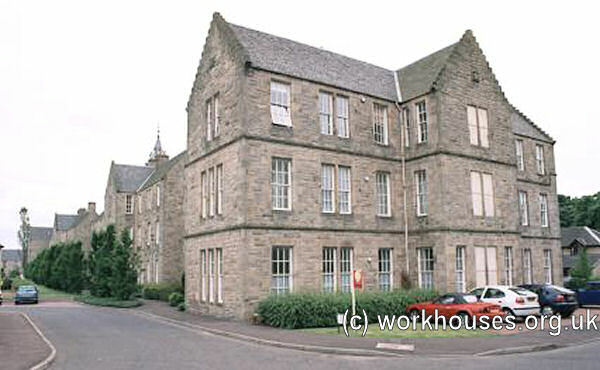 The former Canongate poorhouse was subsequently converted for use as an "epidemic hospital". 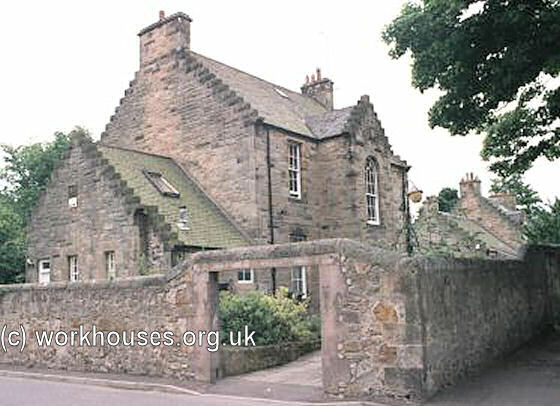 The Charity Poorhouse was replaced by the Craiglockhart Poorhouse which was erected on Glenlockhart Road, Craiglockhart. The laying of the foundation stone took place on 4th July 1867 and construction was completed in 1869. The buildings were officially opened on 2nd May 1870. The competition held for the design of the buildings was won by George Beattie, whose plans allowed for the accommodation of up to 1569 inmates. The new poorhouse was intended to provide both a "comfortable home for the aged and poor" and also a reformatory for the "dissipated, the improvident, and the vicious". The male wing had divisions for "old men of good character", dissolute men", "doubtful old men", and "boys", with similar divisions in the women's quarters. A NEW poor-house for the city of Edinburgh has been erected at Craiglockhart. The site is within a very short distance of the city, and yet the scene is as quiet and as thoroughly secluded as if it were miles away. The principal approach to the building is from the Morningside-road, about a quarter of a mile to the south of the Morningside toll-bar. The new poor-house faces the south, and will ultimately consist of three groups of distinct buildings, viz., the main poor-house in the centre, the infirmary to the east, and the lunatic asylum to the west. At present only the poor-house and infirmary have been erected, though the site of the lunatic asylum has been partly excavated and levelled. The style of the buildings is Scotch. The whole is treated in a plain and simple way, without expensive or ornamental details. The architectural effect is chiefly obtained from the mass and extent of the building, and by the arrangement of the plan in breaking it up into a number of separate blocks. At the centre of the main poor-house a corbelled tower, octagonal in form, rises to the height of 105 ft., and a picturesque and varied outline is given to the long fronts by numerous projections, crowned with crow-stepped gables. The classes are entirely isolated from one another in separate blocks of buildings, each complete within itself, and every class has a spacious airing-court allotted to its own use. Those for the doubtful classes are surrounded by the poor-house buildings and offices, while the better-behaved have airing-courts facing the south, tastefully laid out with walks and plots in which flowers and shrubs will be cultivated. The separation of the building into a number of detached blocks, joined only at one point by a connecting corridor, is a peculiarity of the Craiglockhart Poor-house. The separate block system adopted gives facilities for ventilation and for obtaining sunlight and fresh air for the inmates. A second peculiarity of the building are the special facilities afforded for efficient administration, and for the smooth working of the establishment with a small staff of officials. The poor-house consists of an administrative block in the centre — two blocks in line with it to the west for the male paupers, and two blocks in line with it to the east for the female paupers. As the females are considerably more numerous than the males, a third block is provided for them to the north of the other two, and facing eastward. The buildings are three stories in height, except the east wing block, which is only two stories high. The central corridor of communication, which connects the various blocks on each floor, is in one unbroken line from end to end, without any steps or difference of level ; and from it the officials can, both by day and by night, keep a constant supervision over the various classes without requiring even to enter the wards. The corridor is 6ft. 4 in. wide and is thoroughly well lighted, and ventilated directly from the external air between each block. In the administrative block at the centre, and separating the male and female portions of the building, are the offices of the governor and matron, and the other official apartments. Immediately behind is the dining-hall, and beyond it the kitchen department and stores. The stores are concentrated in a two-story block immediately facing the back entrance, so that all goods on their delivery are at once carried into them. They are in the immediate neighbourhood of the kitchen, where so many of the articles are to be used, and have also separate serving-rooms attached for males and females, where articles not used in the kitchen are distributed to the parties coming for them from the wards. The kitchen, which stands between the stores and the dining-hall, has also serving-rooms attached to it communicating both with the dining-hall and the wards. From the special arrangements adopted, none of the paupers, except those regularly employed in the kitchen and stores, can ever be there without immediate detection, and thus pilfering and many other evils are avoided. From the concentration which has been effected, not only can the governor and matron keep a constant supervision over these important departments, but also a much smaller staff of paid officials will be able to do the work than could otherwise have accomplished it. We come next to notice the sanitary arrangements. Each class is provided with separate water-closets, lavatories, and baths, upon every floor, to which they have ready access both by night and by day. The closets are placed in projections opposite the staircase at the centre of each block, and are entirely cut off from the wards by doors and intermediate lobbies, having thorough cross ventilation. The two walls of the central corridor are built hollow, and a series of chambers about 3 ft. 6 in. are formed along the whole extent of the wall on both sides of the corridor. These chambers are made use of for extracting the foul air and supplying the fresh-heated air. In every block two hot chambers are provided, in which fresh cold air brought from the outside of the buildings is heated by powerful coils of steam pipes, and is covered by the hollow chambers to the various floors. For ventilation a central foul-air trunk is provided in the roof of every block, and each ward has several of the chambers in the hollow walls, acting as extracting flues, and leading the foul air up to the central trunk. At the middle of each block a hot chamber is formed, where the foul air is rarified by the heat from a hot-water cistern, and a current being thus produced, the foul air escapes through a large ventilator into the open atmosphere. Each ward is also provided with Sheringham's patent ventilators in the external walls for the supply of fresh cold air, so that a constant circulation is maintained during the night, and at other times, when the windows are all closed. The day-rooms and dormitories for the various classes of paupers are all large and spacious apartments. They are 35 ft. long by 18 ft. wide, and have 12-ft. ceilings, giving in the dormitories a cubic air space on the average of nearly 500 ft. per bed. The wards are heated at each end by large open fireplaces, with an iron grate and mantel-piece of new design, projecting boldly out into the apartment, and having fire-brick back and sides, so as to radiate the heat in all directions. The fireplace openings have circular heads, and the spandrels on each side are ornamented with foliage, having the poor-house monogram and the date in low relief. The walls of the wards and passages have been all lined to the height of 4 ft. 6 in. from the floor. The plaster-work of all the bathrooms, lavatories, and water-closets is painted in oil, and the wood work varnished. The dining hall is 74 ft. by 48 ft. with accommodation for dining 600 paupers. It is divided by iron columns into a centre and two side compartments, and the ceiling is panelled in squares, with ornamental main couples, brackets, and pendants. There is a platform at one end, suitable for addresses, concerts &c.; and as the dining-hall is at present to be used as the church for the poor-house, the pulpit will be in the mean time placed here. The seating is all open, supported on iron standards, so arranged that the seats can be folded up for cleaning out the hall daily. The kitchen is 30 ft. square by 19 ft. high, and is thoroughly lighted and cross ventilated by large clearstory windows on each side, going right up to the ceiling, so that all steam or vitiated air can be swept away. The kitchen and the scullery adjoining are fitted up with a most powerful steam cooking apparatus. In the kitchen there are 6 steam-cooking vessels several of them 5 ft. in diameter ; and in the scullery there are two large steamers for vegetables, which are prepared by steam in open wire trays much quicker and better than they could be boiled in water. At the back of the internal female airing-courts is situated the washing department, and the enclosed drying and bleaching greens. At the back of the internal male courts are the workshops for the smiths, carpenters, plumbers, tin-smiths, painters, tailors, shoe-makers, bookbinders, &., and adjoining these are extensive farm offices. The infirmary is designed on the pavilion system, now universally adopted in all new hospitals. There are four pavilions arranged in pairs for ordinary cases, and a fifth pavilion at the back, entirely detached, to be used exclusively as a fever hospital. At the centre of the corridor which connects the pavilions is placed the administrative block, which contains the officials' apartments, the dispensary, store-rooms, and kitchen accommodation. The pavilions are two stories in height, and contain one ward on each floor. The governor of the poor-house is accommodated in a detached villa erected on the ground to the west of the main building, and the other officials have apartments within the house. As the Edinburgh Water Company's Act did not embrace the poor-house within the area of supply, it became necessary to obtain a Bill to extend the area so as to include the poor-house. This was passed during the last session of Parliament, but the necessary works authorised in connexion with the Bill have not been begun yet. The total number of pauper inmates for whom accommodation is at present provided is 1,000 — viz. 740 in the main poor-house, and 260 in the infirmary. The lunatic asylum, which, as we have said is not yet begun, will accommodate 160 additional. The contracts for the poor-house, infirmary and governor's house at present erected amount to about 45,000l, exclusive of roads; and we understand that there is every prospect that the whole expenditure will not exceed the sum originally contemplated, — viz. 50,000l. Messrs. George Beattie & Son of Grove-street, are the architects of the building. The contractors are Mr. Robert Hutchison for the mason work; Messrs. Kemp, Murray & Nicholson for the joiner work ; Mr. William M'Calman for the plumber work ; Mr. William Anderson for the slater work; Messrs. Ross and M'Lean for the plaster work; Messrs. J. Young & Co. for the ironwork; Mr. Andrew Cunningham for the glazier work; Mr. John Meiklejohn for the heating; Messrs. John Bryden & Sons for the bells; Messrs. Andrew Muirhead and G.H. Potts for the painting; and Mr. John Mellon for the roads, &c. The clock and bell have been supplied by Messrs. Robert Bryson & Son; and the iron cistern and tanks by Messrs. John Whitelaw & Son, Dunfermline. Mr. Andrew Wood is the clerk of works. The central administration block of the poorhouse had an ornate "John O'Groats" tower. Edinburgh Craiglockhart Poorhouse central block from the south, 2001. The addition of further wings in 1904 is said to have resulted in one east-west corridor reaching a quarter of a mile in length! Males were accommodated in the blocks at the west, and females at the east. Edinburgh Craiglockhart Poorhouse male blocks from the south-west, 2001. Edinburgh Craiglockhart Poorhouse from the north-west, 2001. A large pavilion-plan infirmary complex lay at the east of the site. Like the main poorhouse, this had a central administrative section with separate male and female wings to each side, again all connected by corridors. Edinburgh Craiglockhart Poorhouse infirmary from the south-east, 2001. The poorhouse governor had his own house at the west of the site. Edinburgh Craiglockhart Poorhouse governor's house from the north-east, 2001. Craiglockhart was run by the City of Edinburgh Parochial Board until 1894 when responsibility passed to the Edinburgh Parish Council who also took over the St Cuthbert's Combination whose poorhouse then became known as Craigleith. Initially, it was intended that Craigleith would be used for the aged and infirm, the sick, and generally for the more respectable class of indoor poor, while Craiglockhart would be used for the less aged and for "test" cases (i.e. those whose eligibility for poor relief was under question). However, this division was not rigorously applied and cases were allocated to a particular establishment by the application clerk. Test work for male inmates at Craiglockhart and Craigleith included stone-breaking, floor-scrubbing, and the splitting, bundling, and delivery of firewood around the city's streets. Tradesmen such as painters, joiners, shoemakers, bakers, etc. could also be given work relating to their occupation. For female inmates, test work included laundry work, scrubbing, and sewing. The inmates at Craigleith generally worked for 7¼ hours a day, while those at Craiglockhart worked for 7¾ hours. In 1908, the Board of Supervision published extracts from the previous year's annual report by the Craiglockhart poorhouse's governor, Mr W. Bennett. Inmates are employed as tailors, shoemakers, carpenters, painters, blacksmiths, plumbers, warders, scrubbers, at wood-splitting, flax-teasing, sewing and laundry work; and on the farm, garden, and roads. These are found to be financially profitable. The children receive an elementary education at the Protestantand Catholic schools in Slateford, and religious training in the Institution. Thirty-six children have been boarded out during 1905. The daily average number in the Poorhouse for the year was 111. Girls are trained in sewing, knitting, and housework. Boys are trained in garden work during summer. 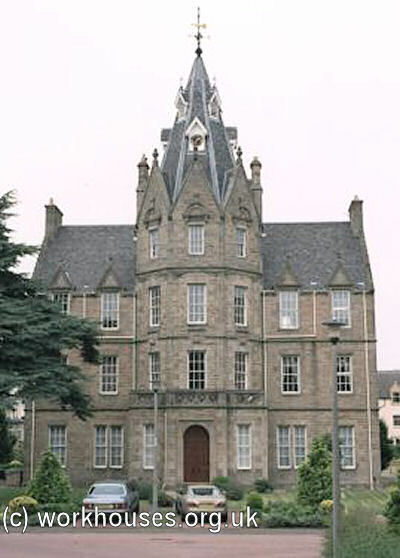 After the Second World War, the building became a residential home for the elderly and a long refurbishment programme was undertaken by Edinburgh Corporation. 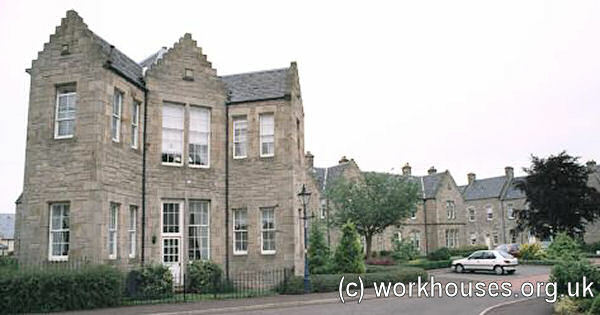 In the 1960s, the running of the home was taken over by Lothian Region's Social Work Department and it was renamed Greenlea Old People's Home. The buildings have now been redeveloped for residential use. The Orphan Hospital, founded in 1733. In 1833 it moved to a new building, erected at a cost of £16,000 and situated about a mile to the west of Dean Bridge. The Queensberry House of Refuge and Night Refuge at 64 Canongate. The Girls' House of Refuge at Dalry in the western suburbs. The Rescue and Probationary Home for Fallen Women, instituted in 1861 at 18 St John's Hill. The Edinburgh Industrial Home for Fallen Women, at Alnwick Hill, near Liberton. The Canadian Home for Friendless Girls (the Edinburgh Emigration Home) on Lauriston Road. The Hospital for the Aged and Infirm, run by the Little Sisters of the Poor. Greenlea Old People's Home: A Brief History by Lothian Regional Council Department of Social Work. The Builder October 9th, 1869. Pottery from the Edinburgh City Poorhouse by Joanna Dawson.